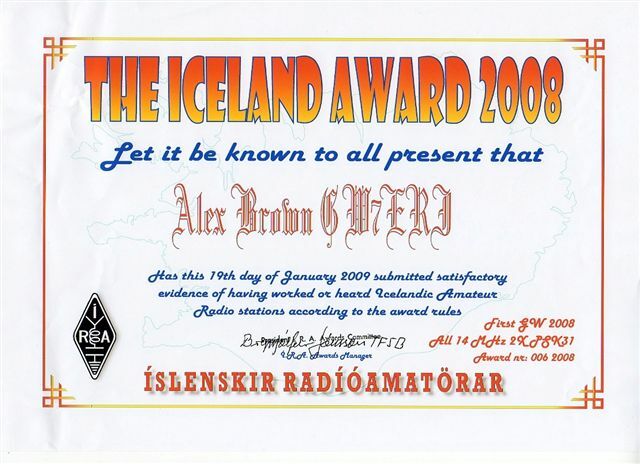 Here are some of the awards I have gained whilst enjoying my Ham Radio hobby. 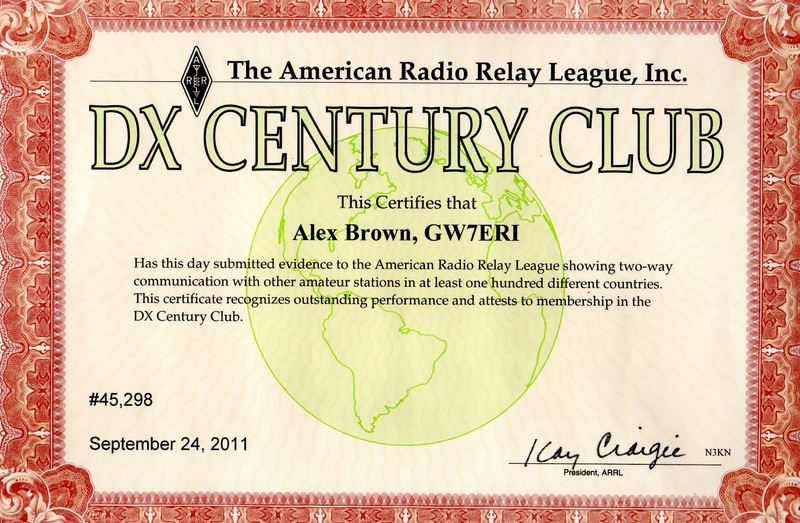 ARRL DX Century Club Award. 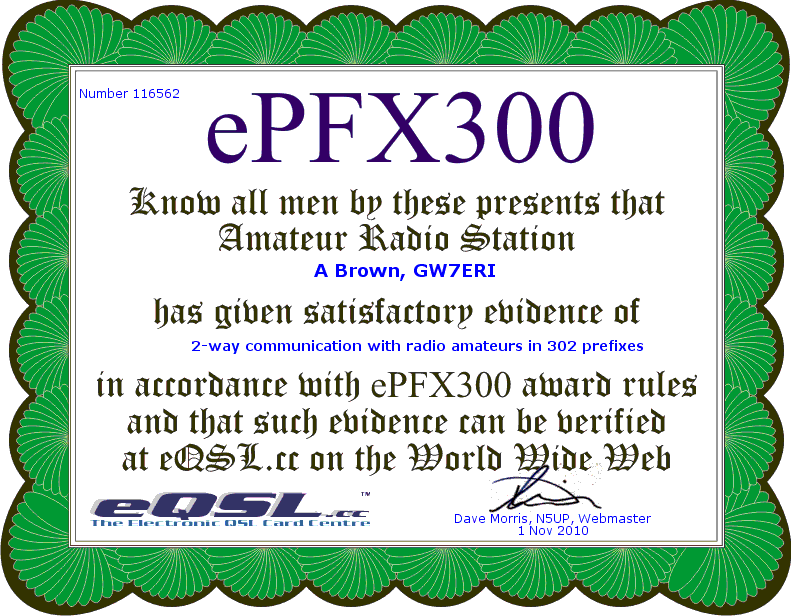 Certificate for submitting evidence of 100 Countries Contacted by Radio. 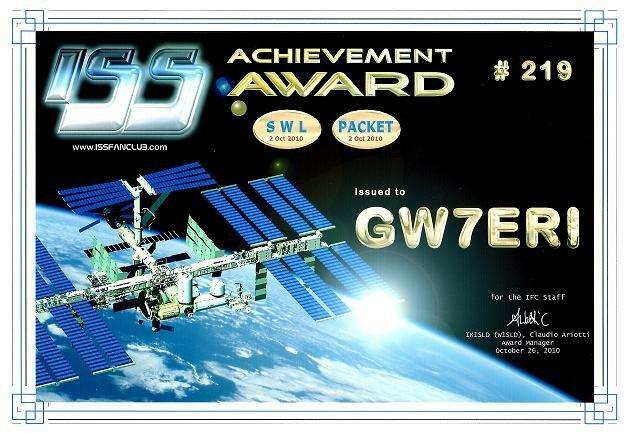 Confirmation achieved by using ARRL 'Logbook of the World' electronic QSL facility. 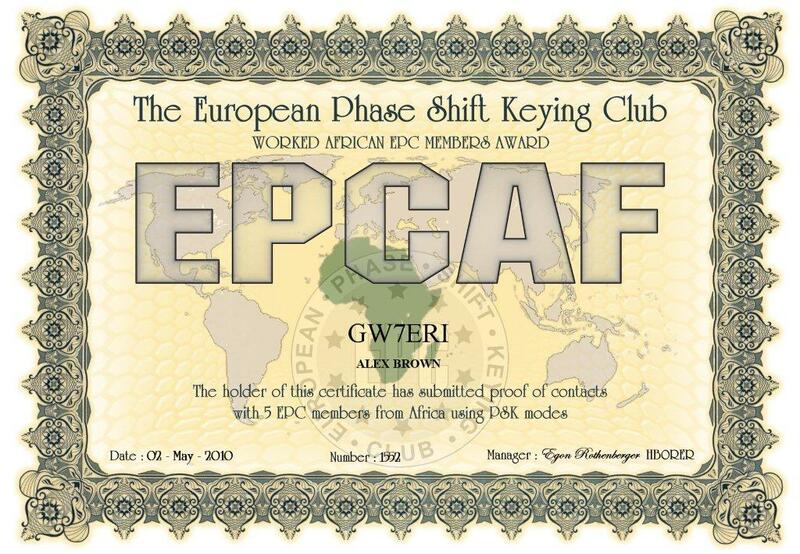 Contacted All Continents Award. 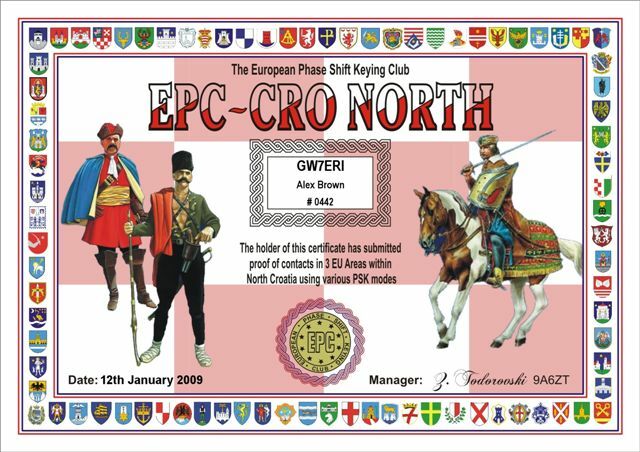 General and 20 Meter Band Award. 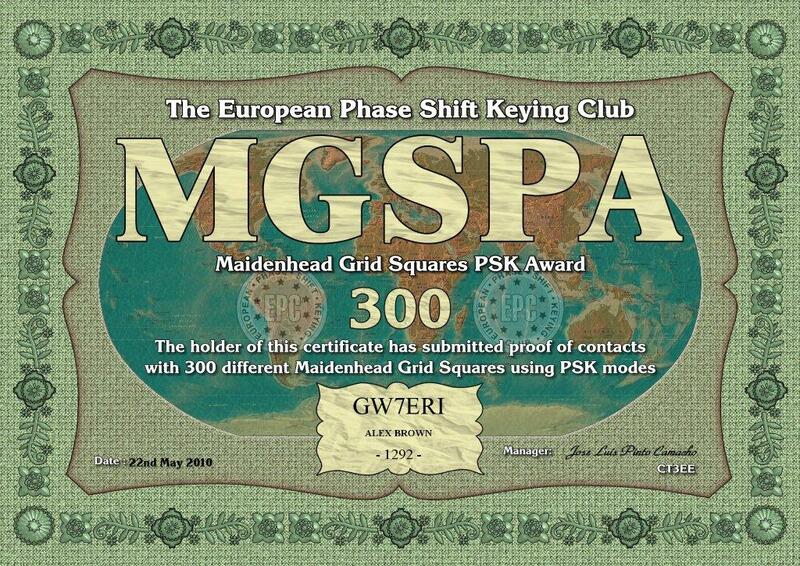 Maidenhead Grid Square Locator Award. 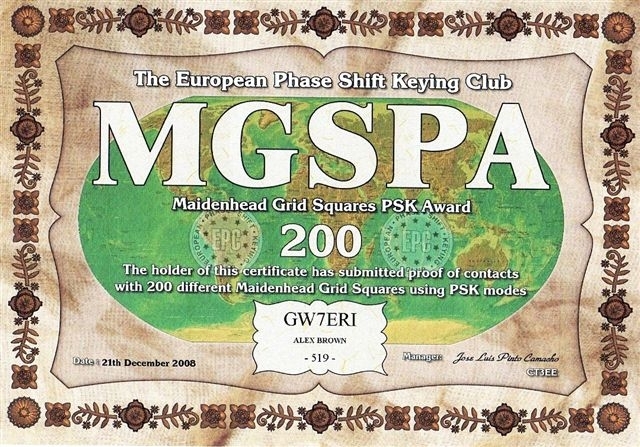 100, 200 and 300 Squares Awards. 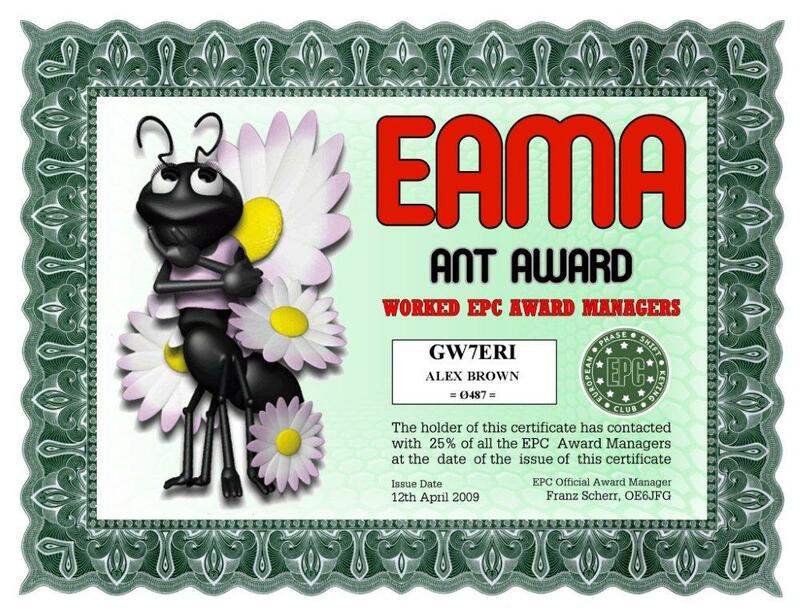 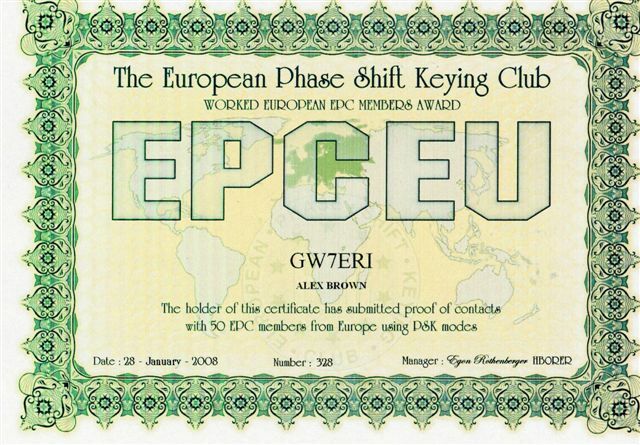 EPC Club Members Awards. 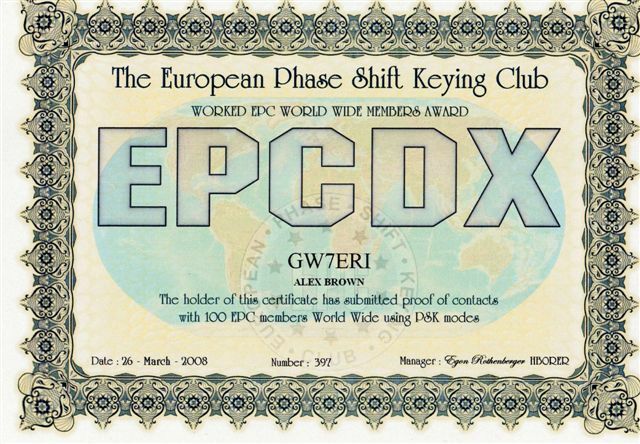 Europe, Africa, Asia and DX. 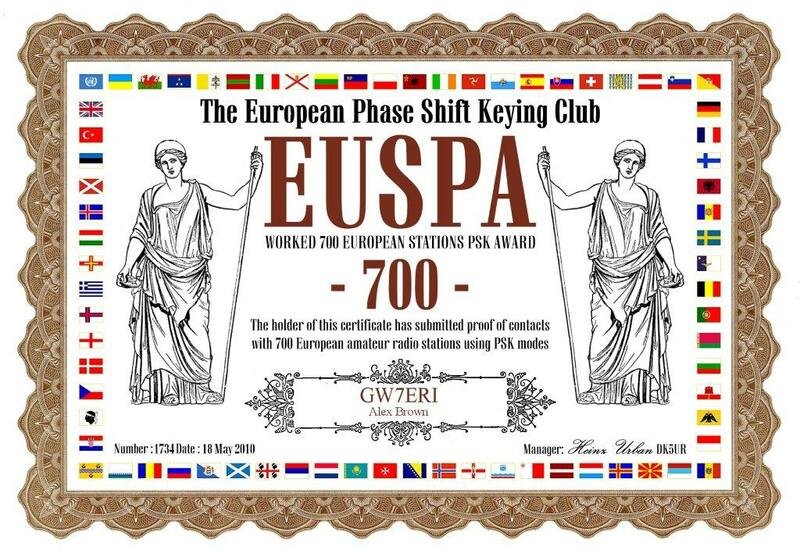 European Administrative Areas Award. 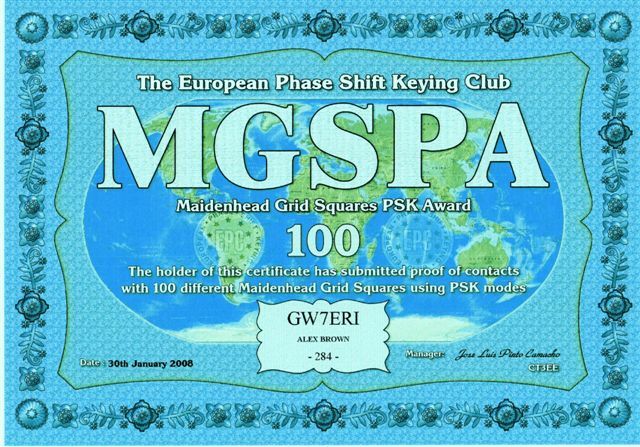 100 and 200 Areas Awards. 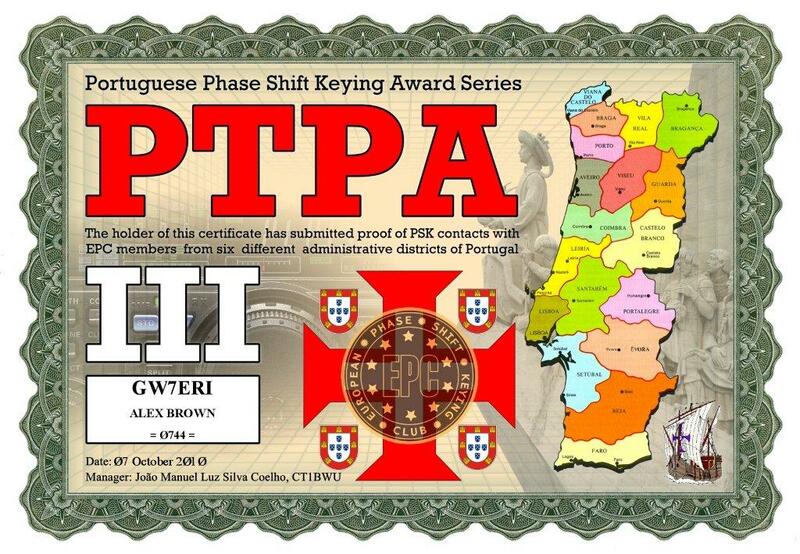 Call sign Prefix Award. 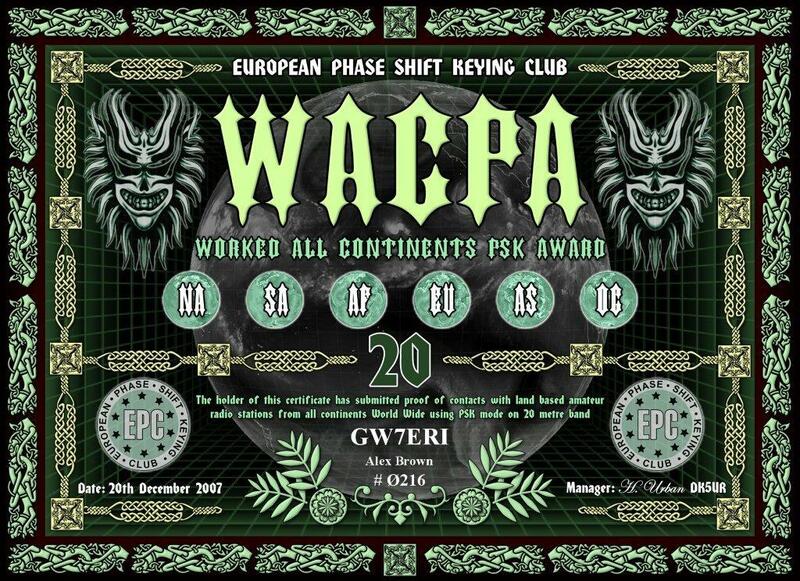 100, 200, and 300 Prefixes Awards. 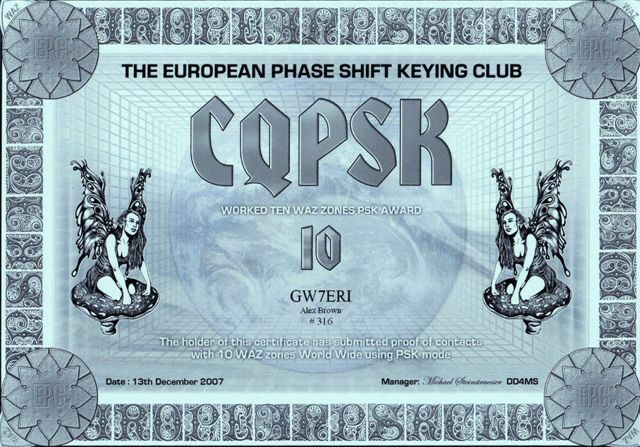 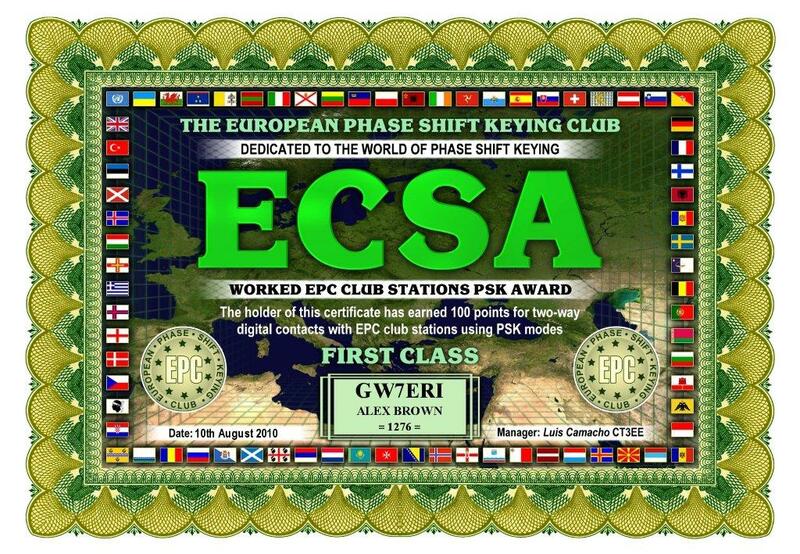 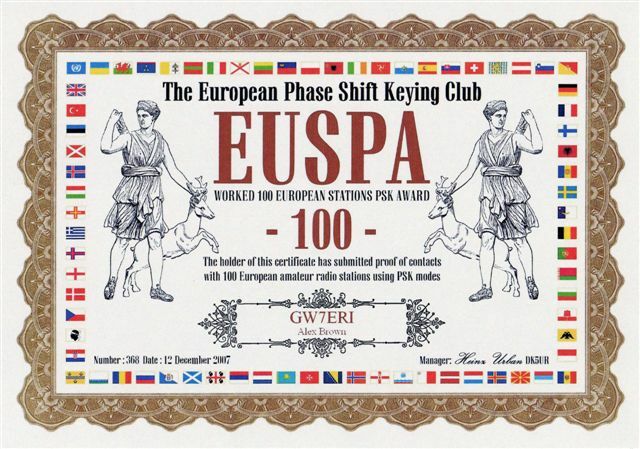 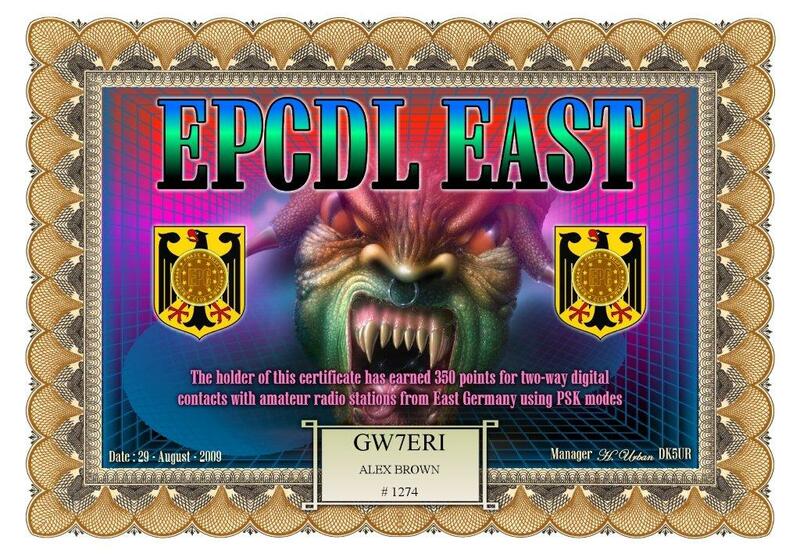 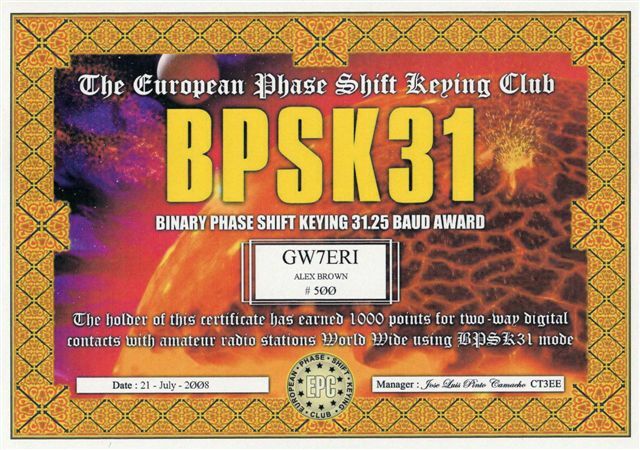 European PSK Station Award. 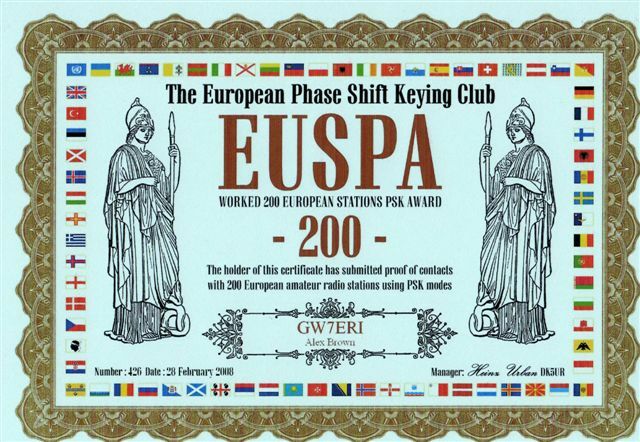 100,200,300,400,500,600,700 European Stations Awards. 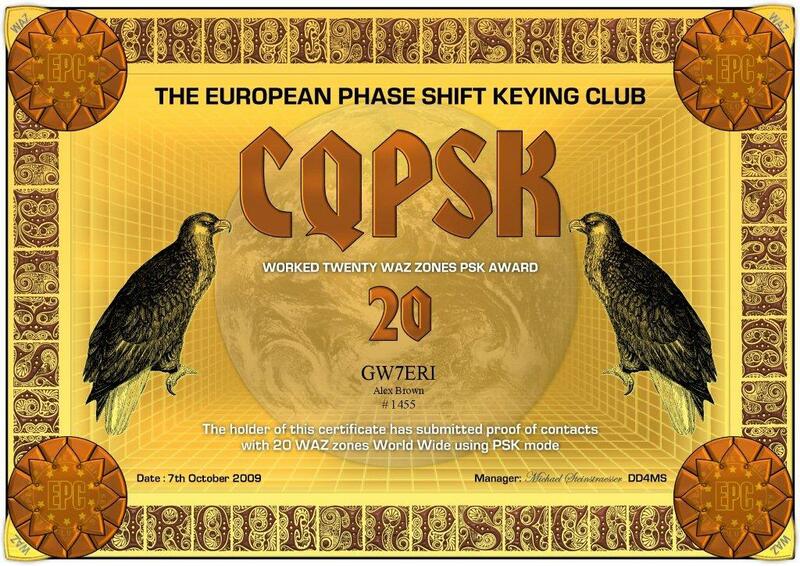 Contacted 10 and 20 CQ WAZ Zones using PSK Mode. 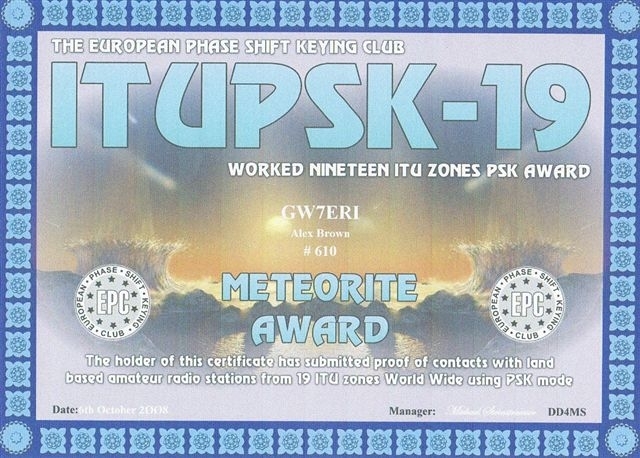 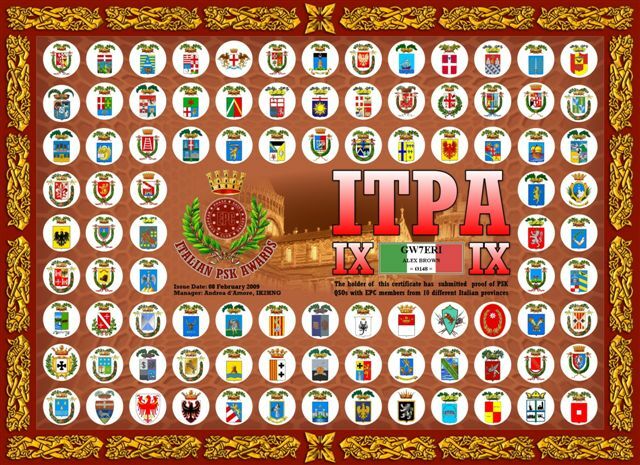 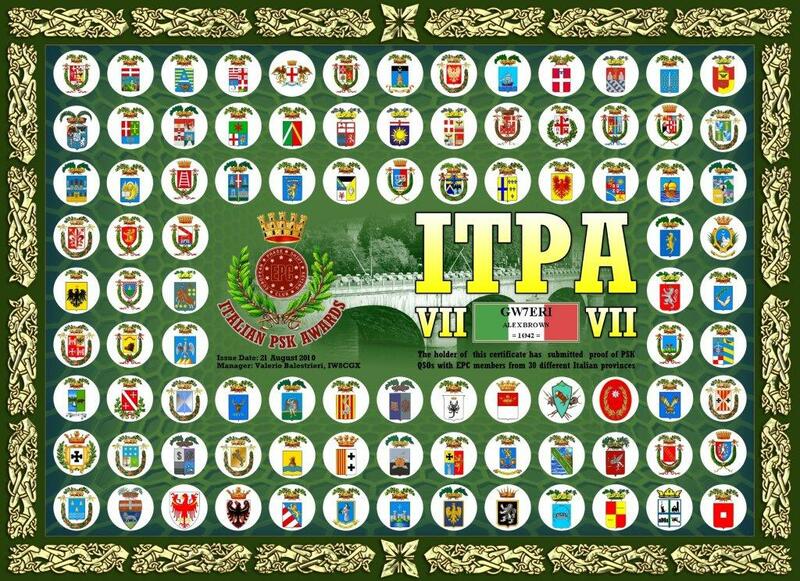 Contacted 19 ITU Zones on PSK Mode. 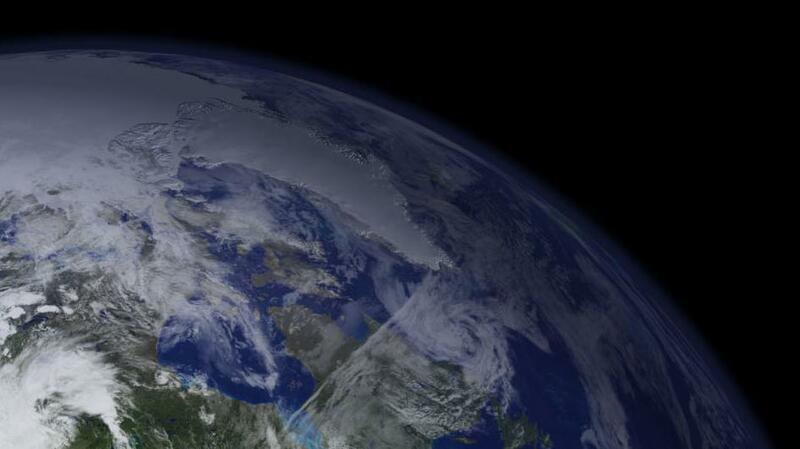 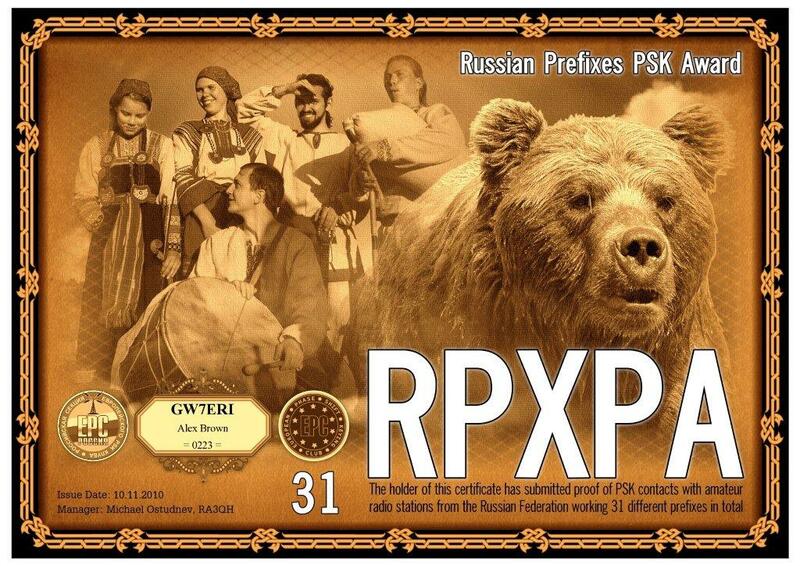 Contacted 50 DXCC Countries on PSK Mode. 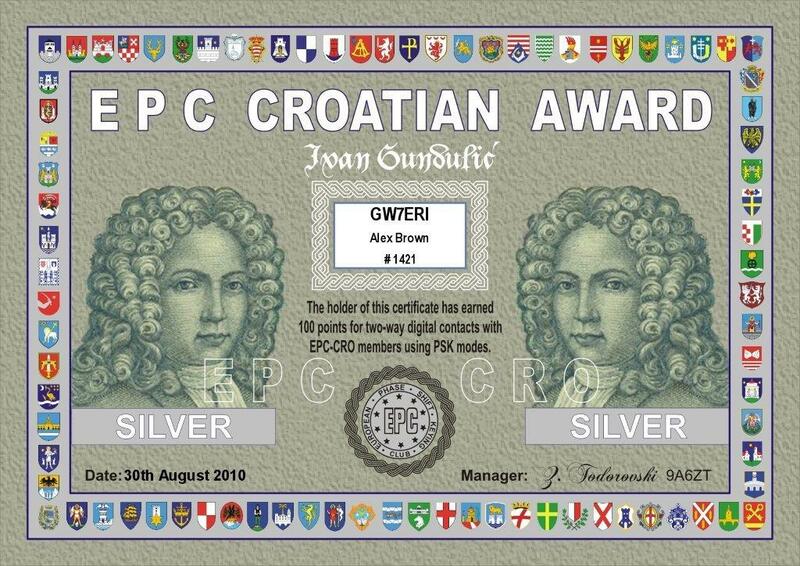 Croation PSK Bronze and Silver Awards. 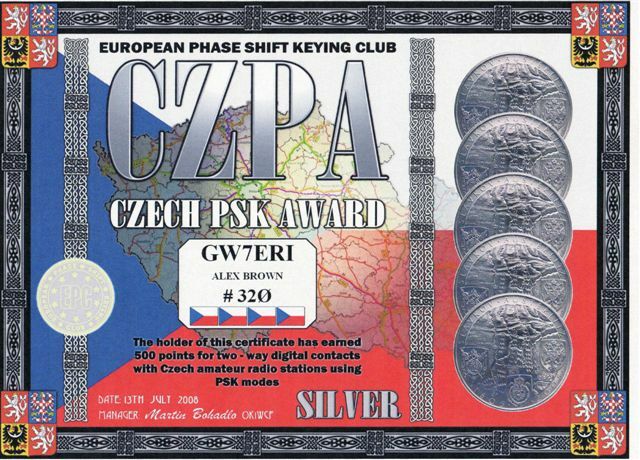 Czech PSK Stations Award. 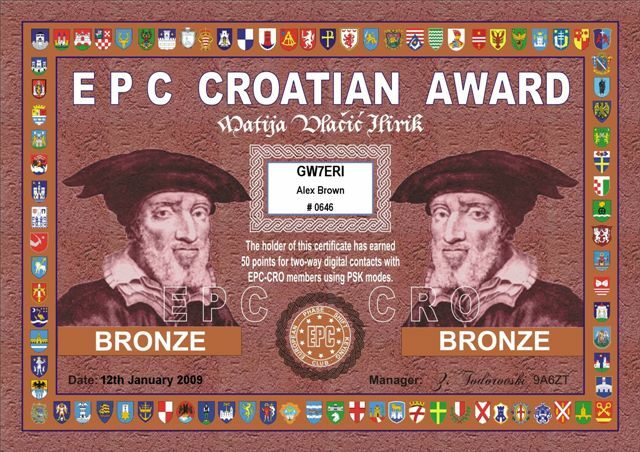 Bronze and Silver Awards. 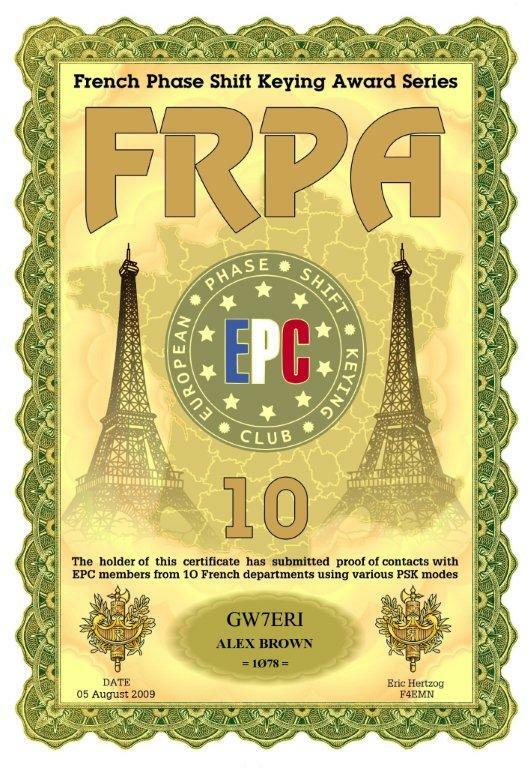 10 French Departments PSK Award. 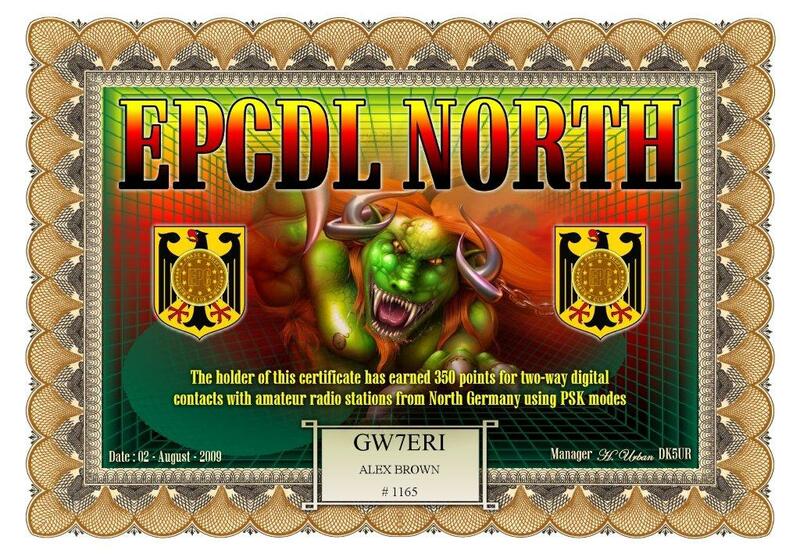 Northern Germany PSK Award. 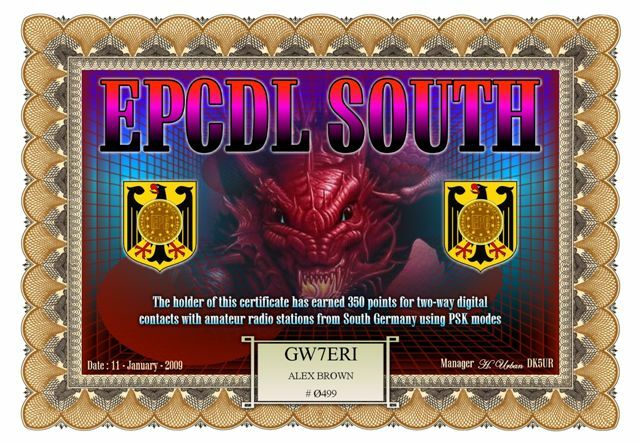 Southern Germany PSK Award. 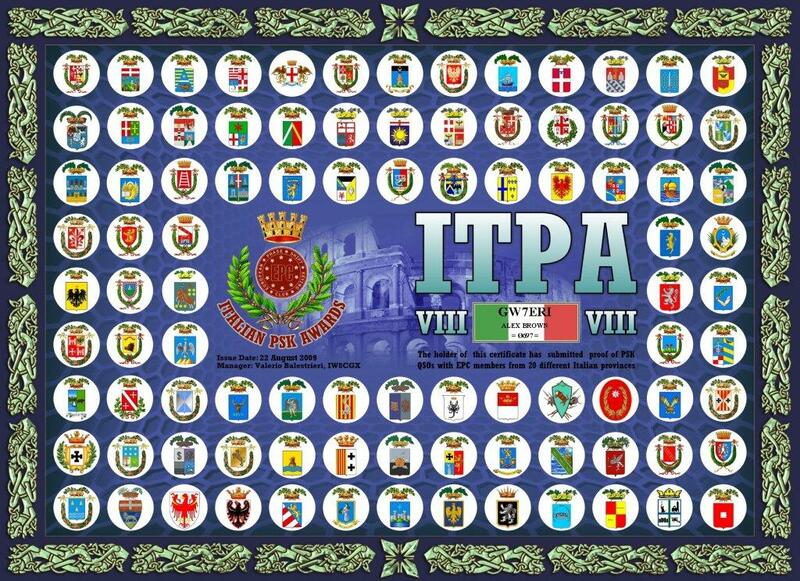 Italian Provinces Award. 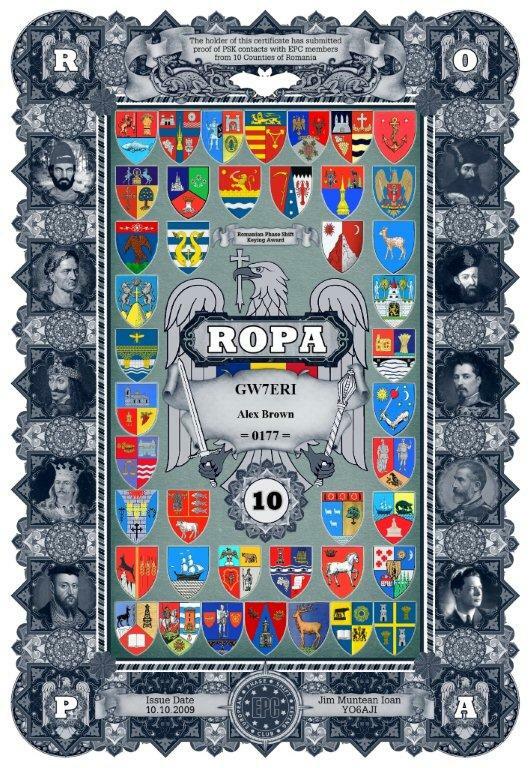 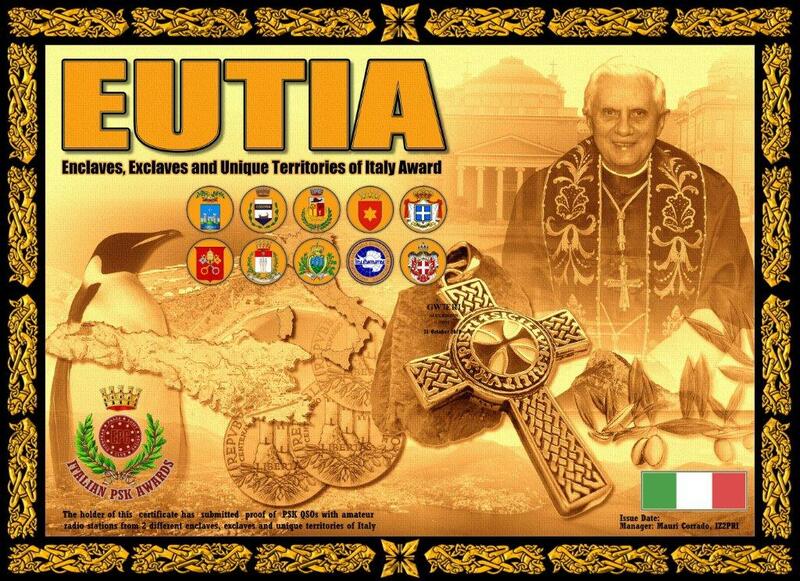 10, 20 and 30 Provinces Awards. 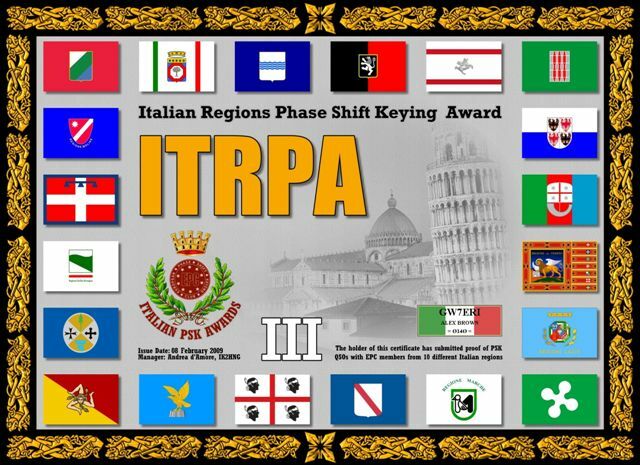 Italian Regions Award. 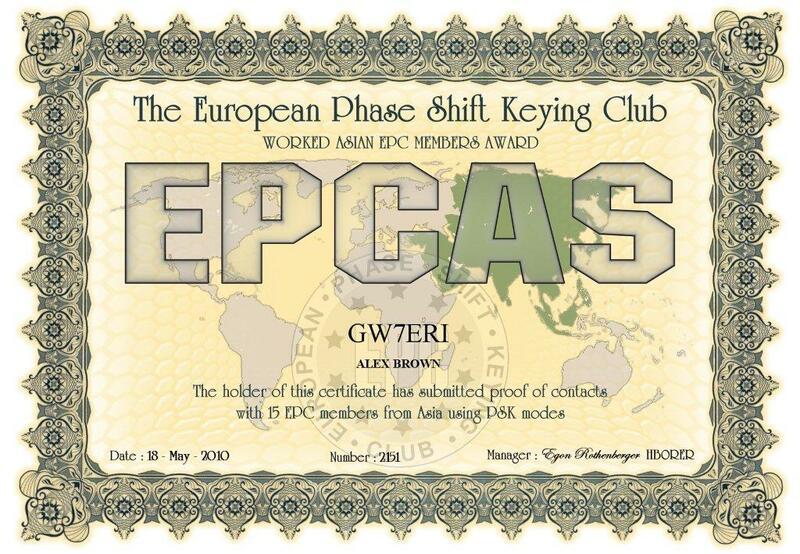 EPC members in 10 and 20 Italian Regions Contacted. 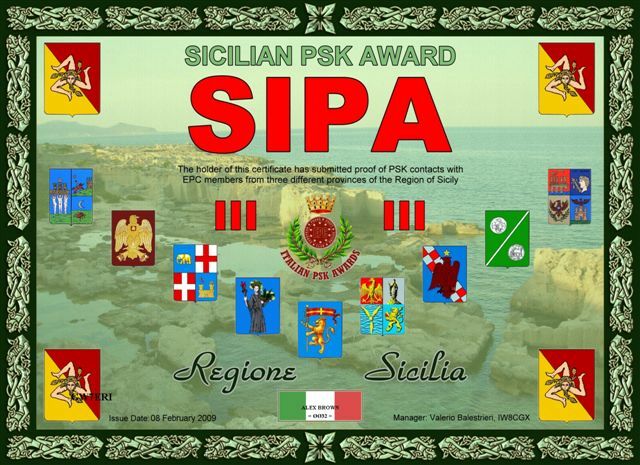 Italian Call Sign Prefixes Award. 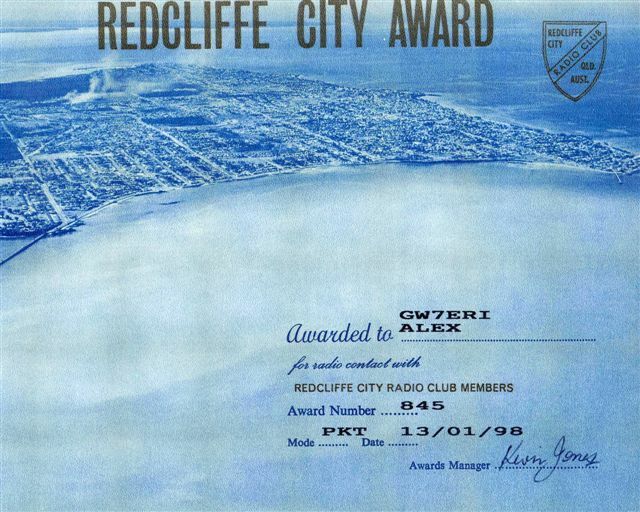 15 and 25 Call Signs Awards. 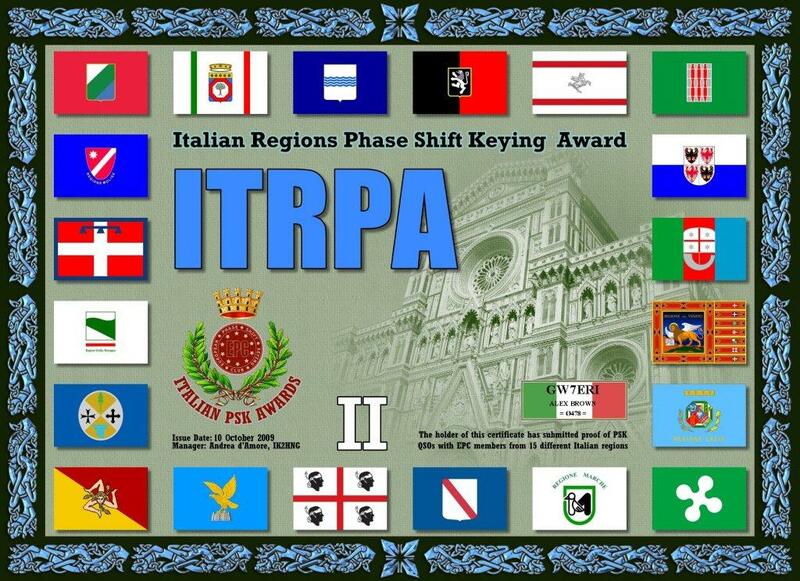 Italian Call sign Prefixes Award. 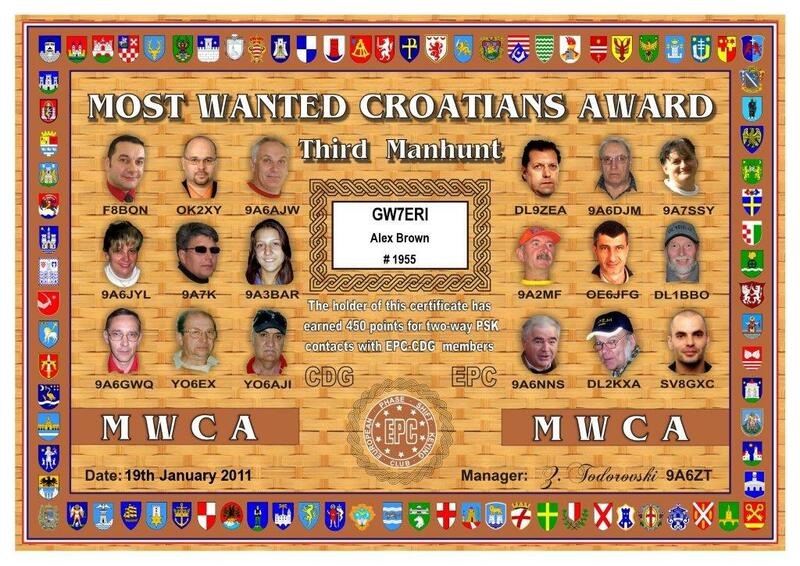 35 Call Signs Award. 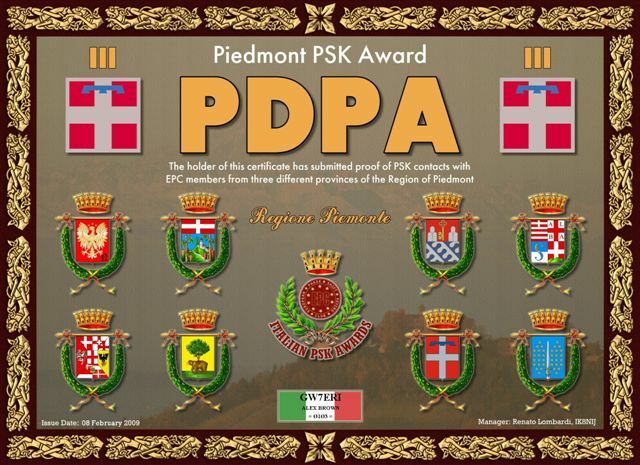 Contacting EPC Members from three provinces of the Italian Piedmont Region. 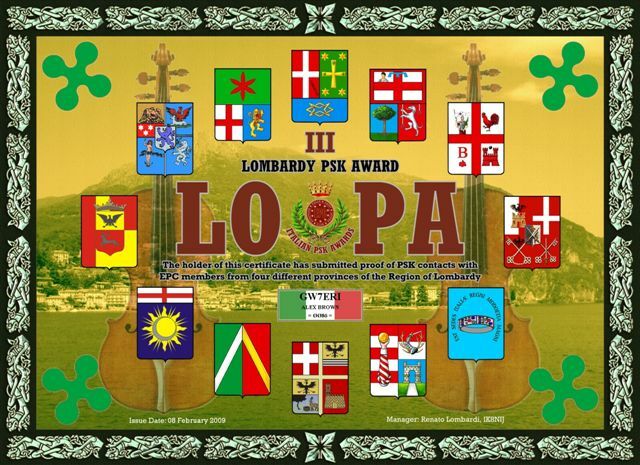 Contacting EPC Members from four provinces of the Italian Lombardy Region. 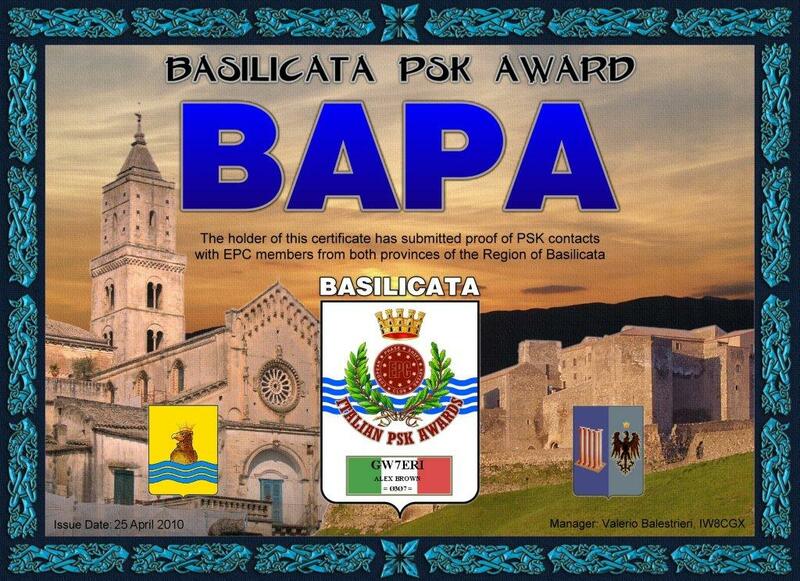 Contacting EPC Members from three provinces of the Italian Sicily Region. 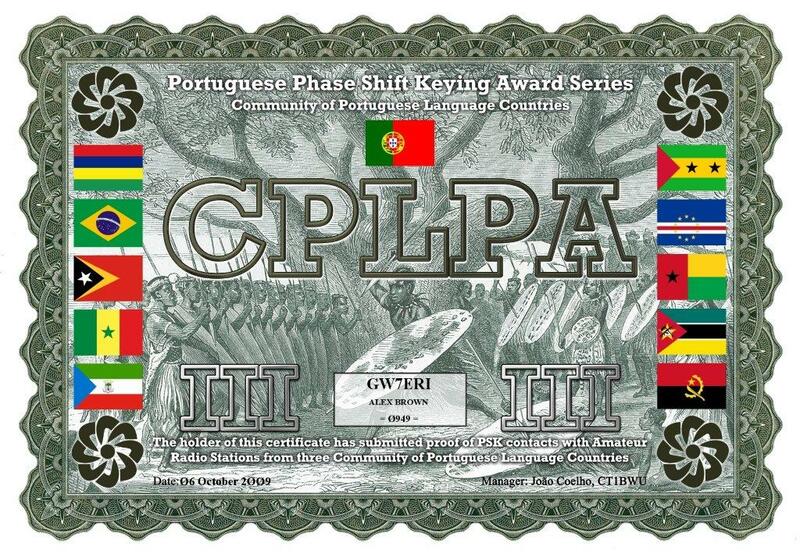 Contacting 'Portuguese Language Countries' - Three Countries Award. 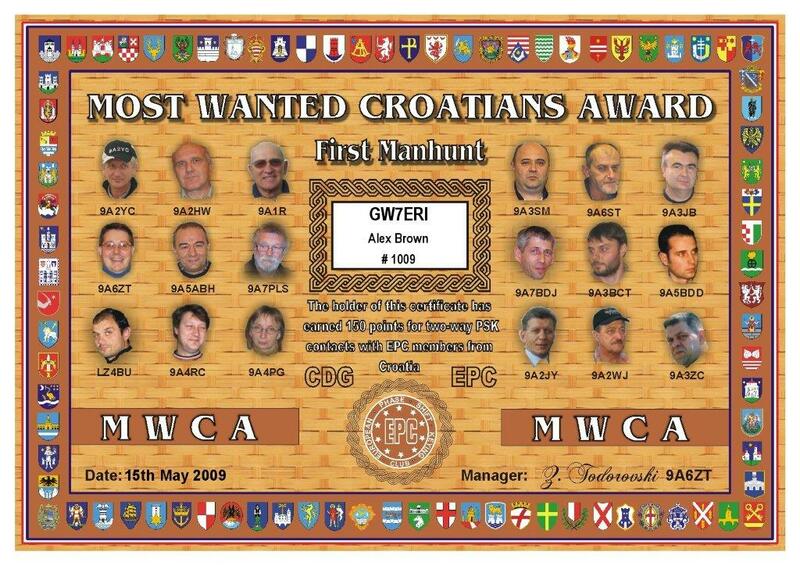 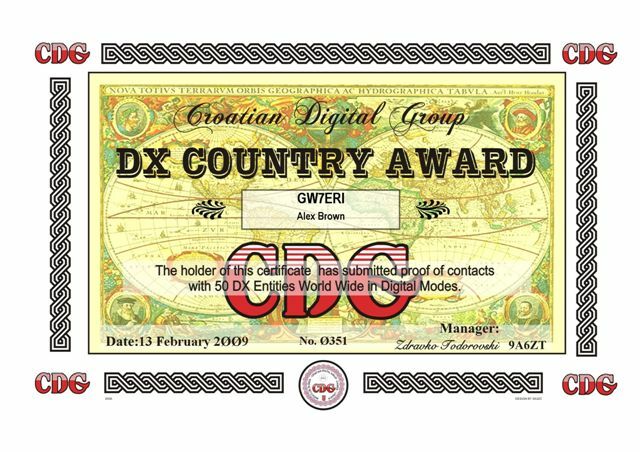 Romanian Counties Award - 10 Counties Contacted. 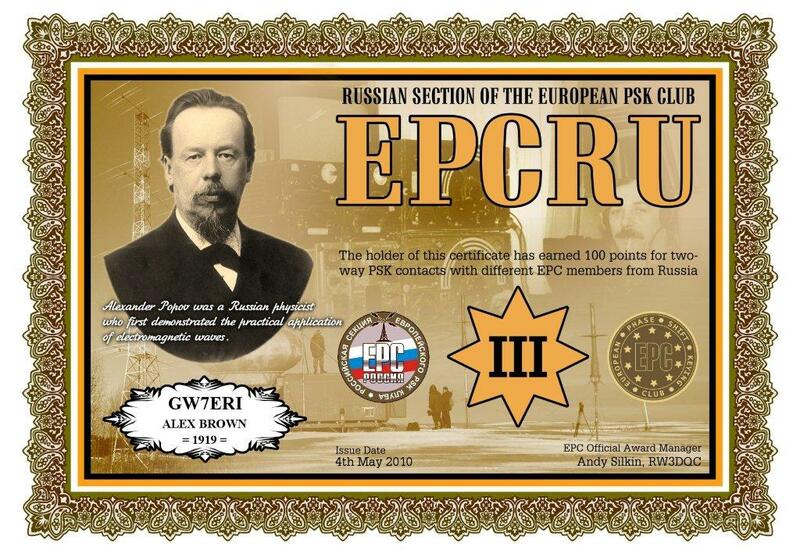 Contacting Russian EPC Members Award. 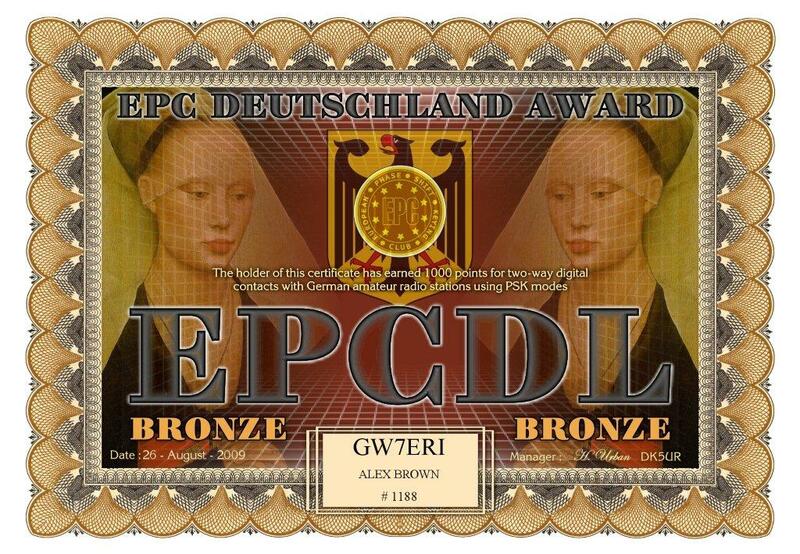 Contacting Russian Federal Subjects Bronze Award. 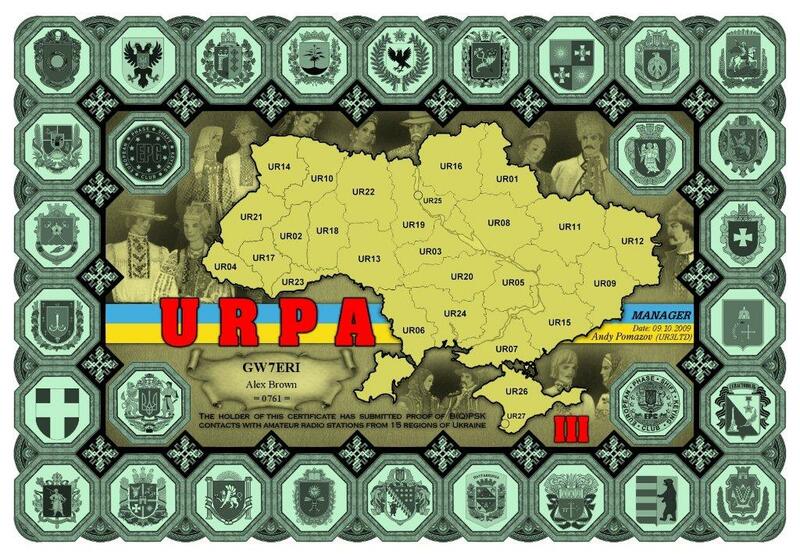 Ukraine Regions Award - 10 regions contacted. 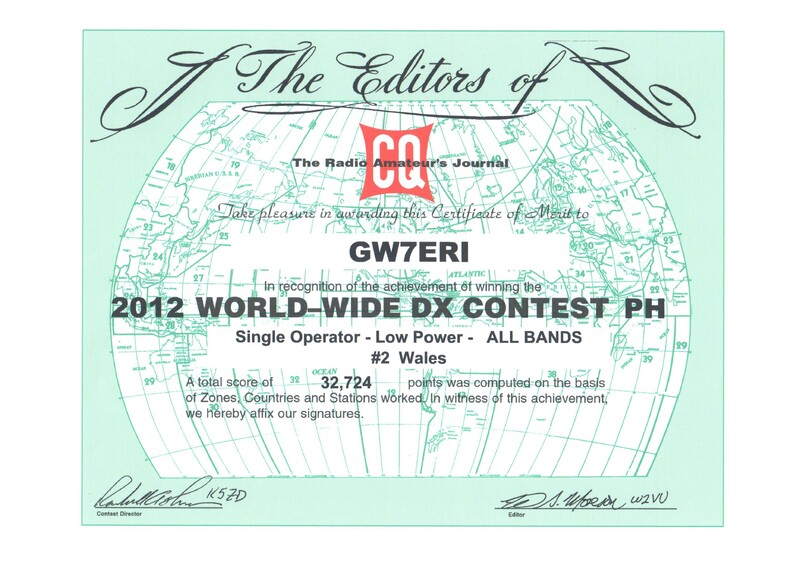 CDG Award for making radio contact with Radio Amateurs In All Continents using Digital Transmission Modes. 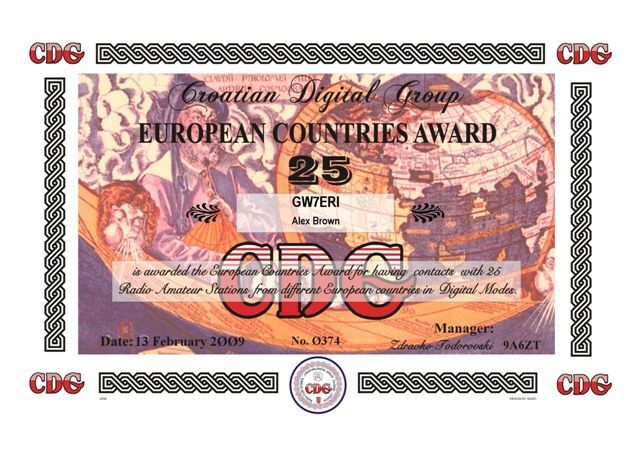 CDG Award for making radio contact with 25 European Countries using Digital Transmission Modes. 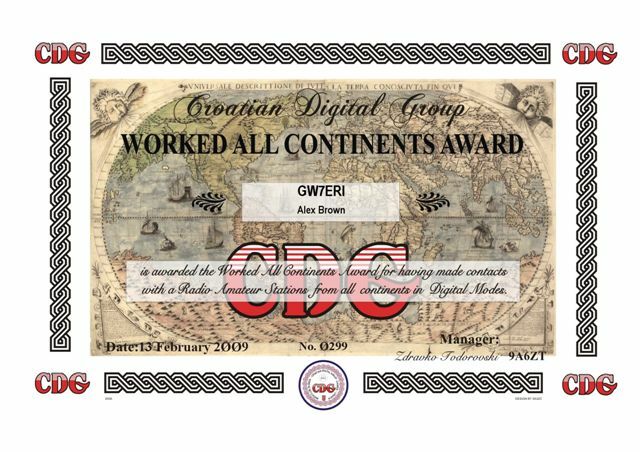 CDG Award for making contact with Radio Amateurs in 50 Countries using Digital Transmission Modes. 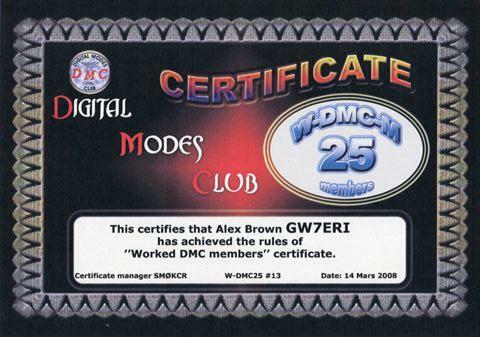 DMC Award For Contacting 25 DMC Club Members. 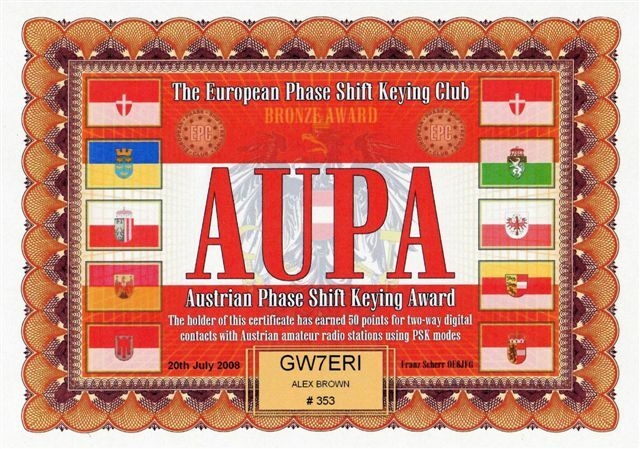 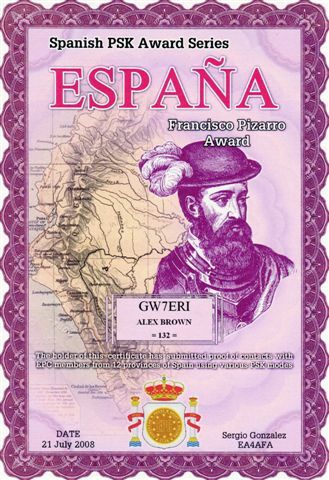 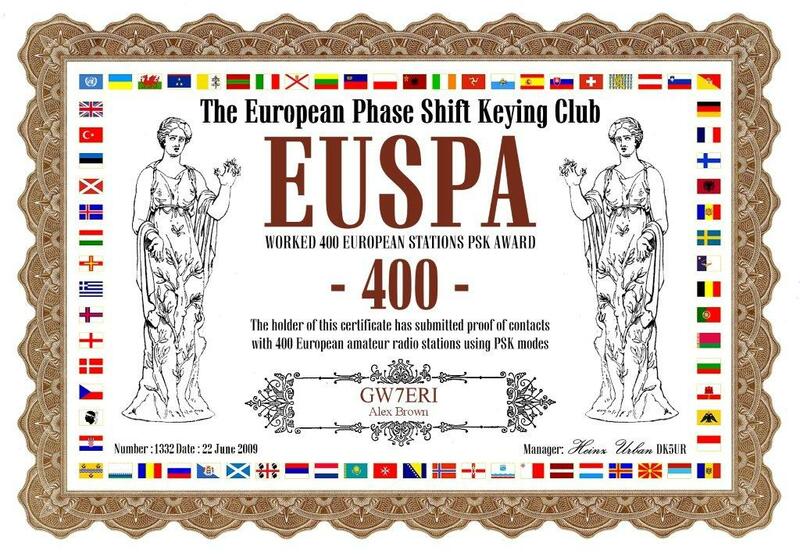 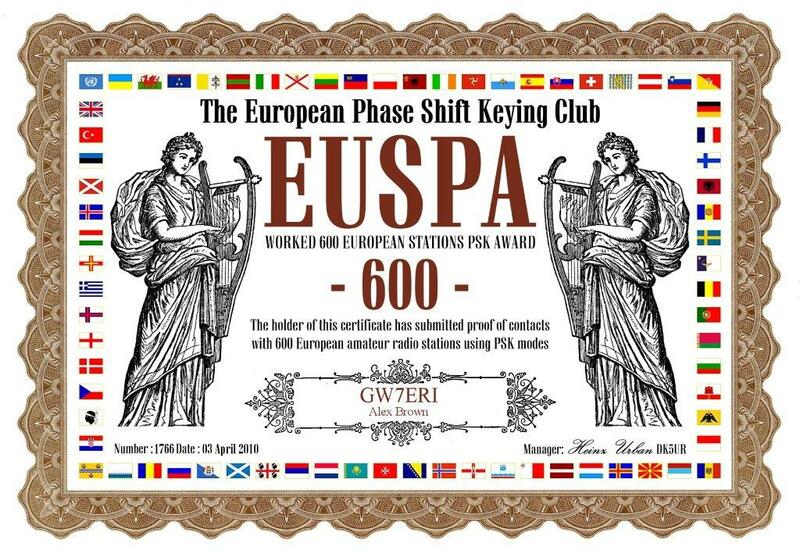 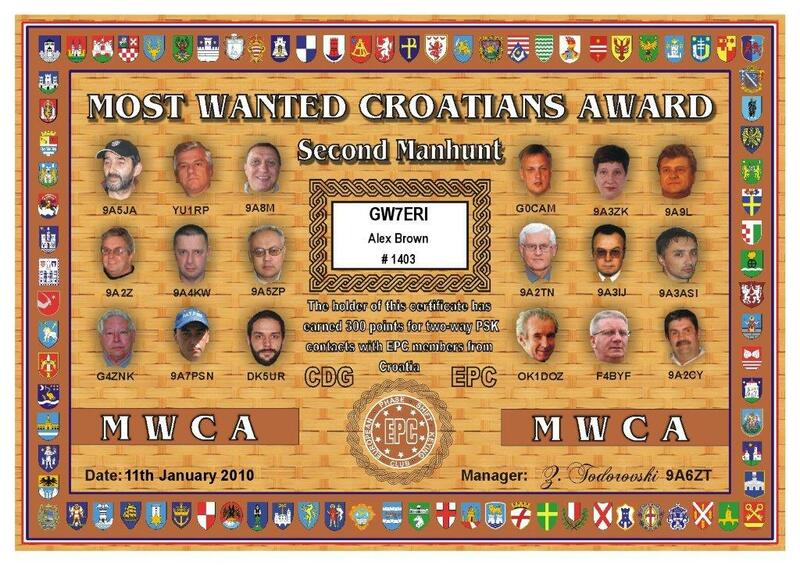 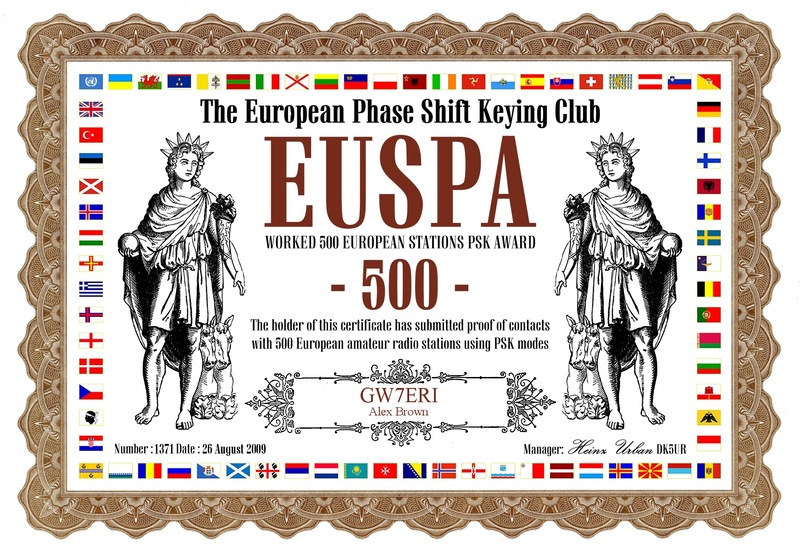 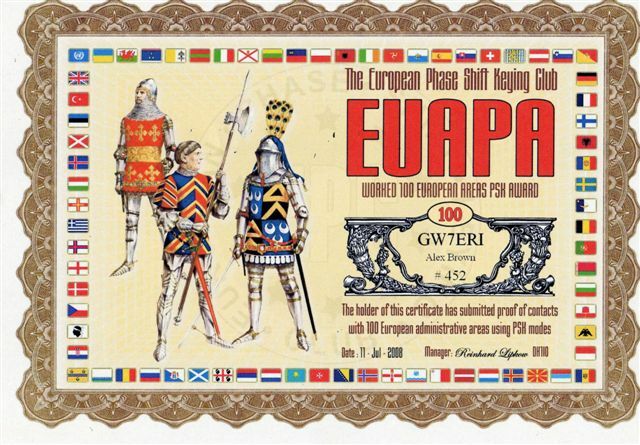 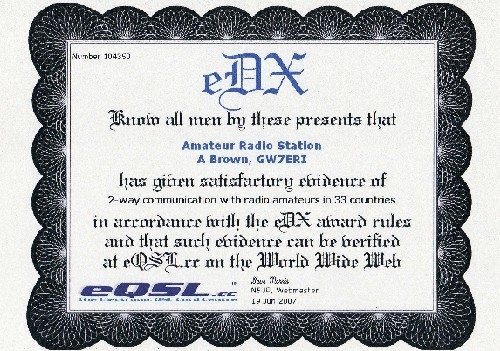 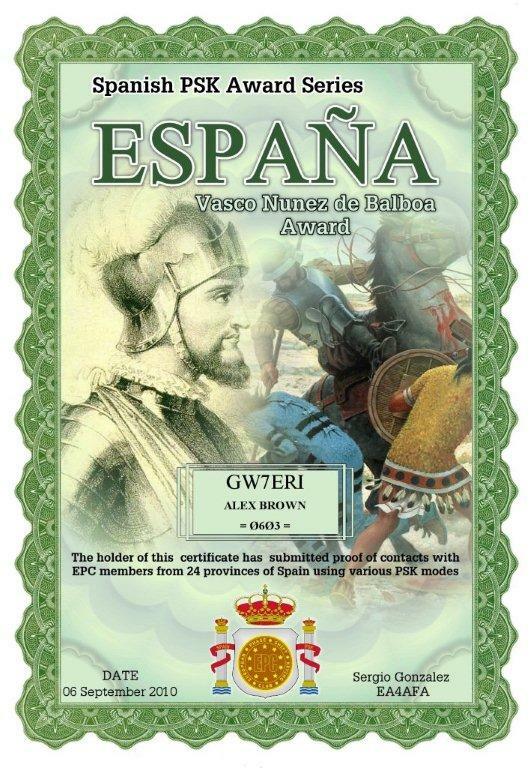 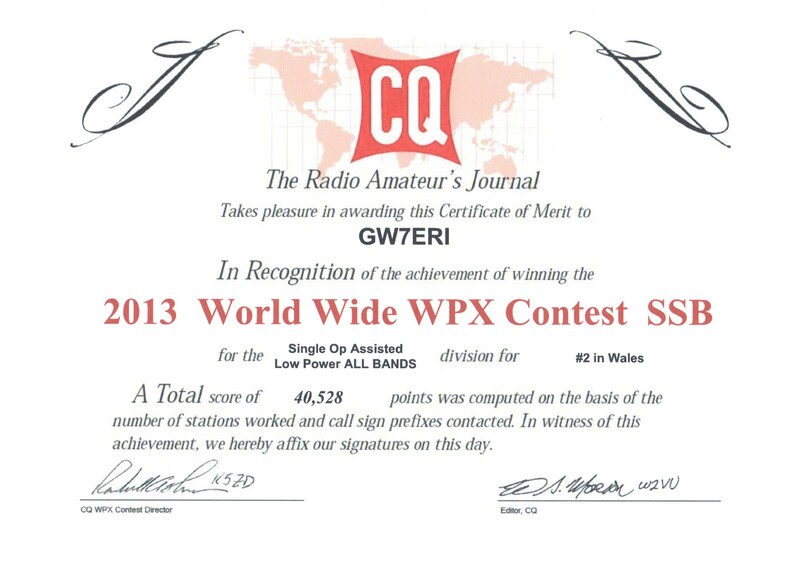 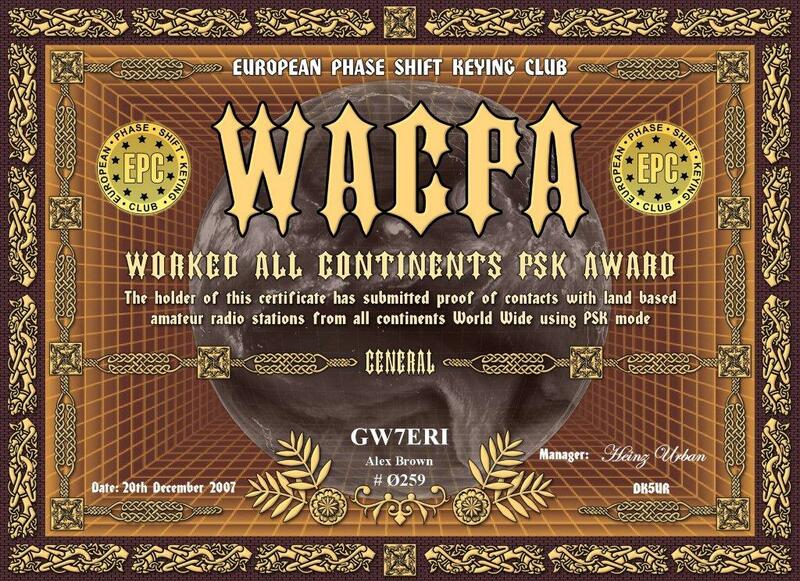 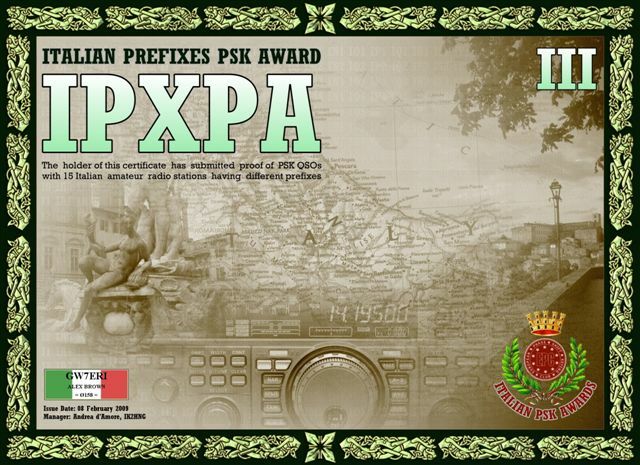 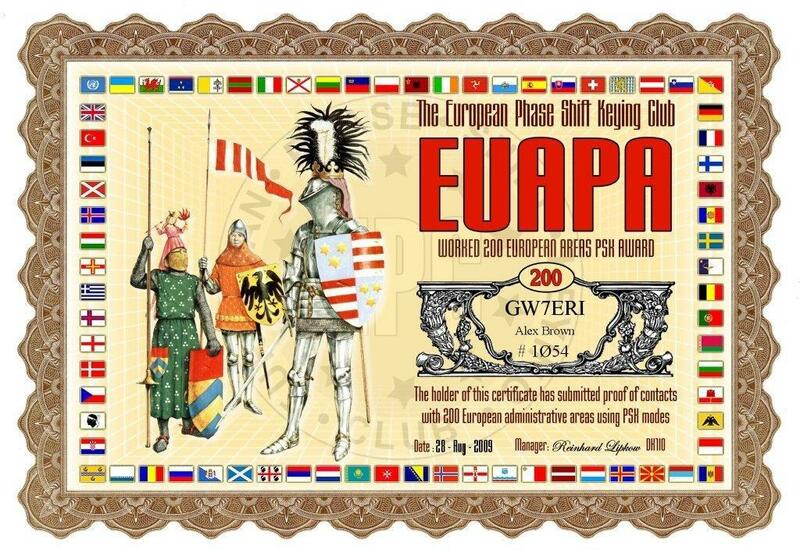 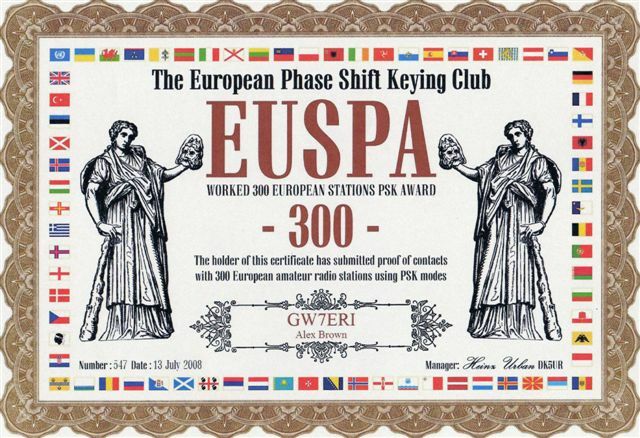 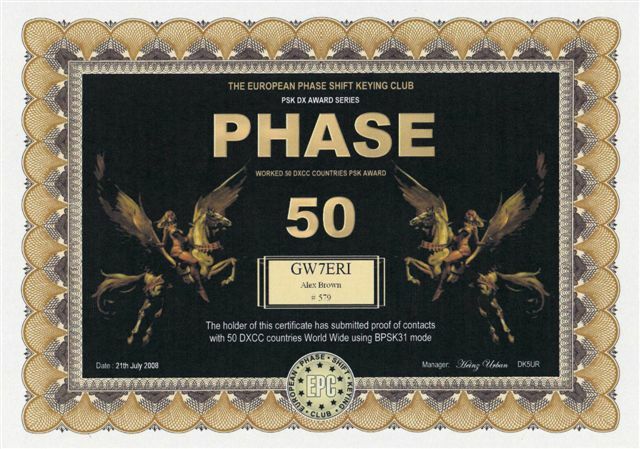 EQSL Contacted 25+ Countries and 300+ call sign prefix awards. 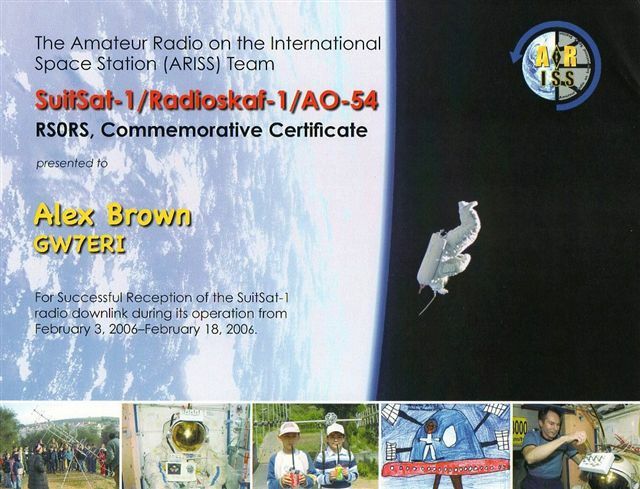 Commemorative Certificates for successful reception of SuitSat-1, and voice transmissions from the International Space Station celebrating 25 years of Ham Radio in space. 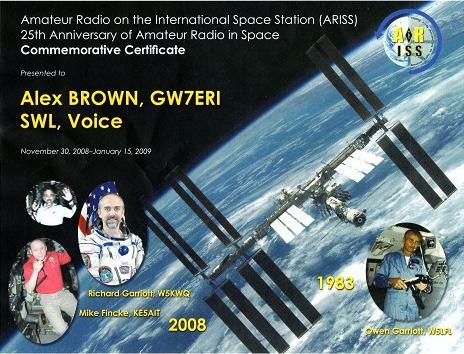 Achievement Award issued by the ISS Fan Club for the successful transmission of Data Signals (APRS Packet) through the Radio/Computer equipment on board the International Space Station. 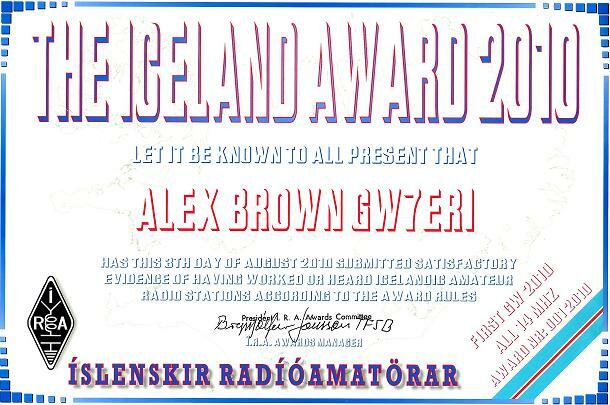 2008 / 2010 Iceland Award for making radio contact with Icelandic Amateurs. 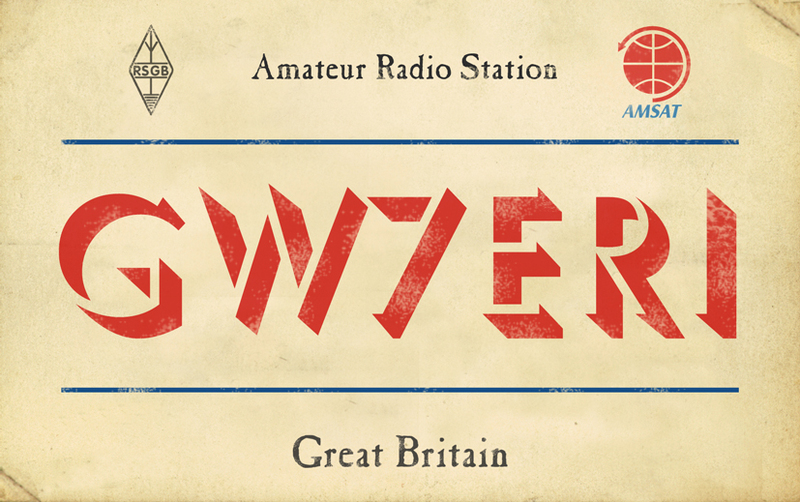 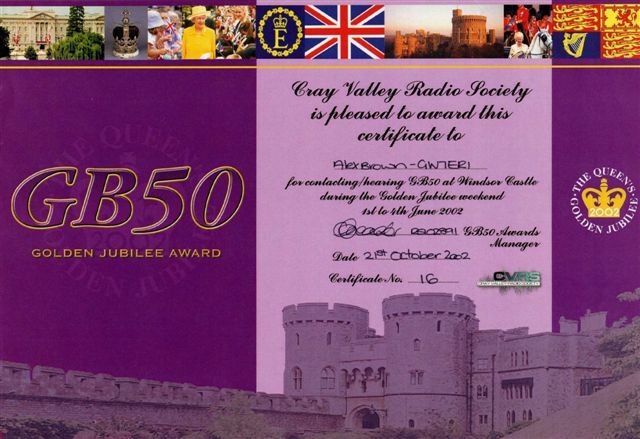 for making contact with GB50 station at Windsor Castle.